to arrive at or achieve something as if by a spring or leap: to vault to prominence. to cause to leap over or surpass others. I’m super excited to invite floralpreneurs inside, The Vault. This is the biggest collection of my very best “real flower business stuff” from the last 3+ years all in one place! You can get it here for just $13. *Yes, you can expect to find new content added to The Vault from time to time! Over 30 videos and livestreams plus downloadable pdfs to help move your business forward…no matter what your experience level there’s something for you inside The Vault. Click HERE to unlock The Vault today for just $13. 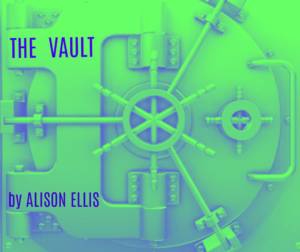 I decided to call this course, The Vault, because it’s filled with my “valuable resources”, but I hope that what you find inside this course will help you “vault to prominence”! I believe every florist should turn a profit in business and every floral designer should recognize the value of your time & expertise. The intention of what I teach is to help encourage, reassure, or instruct florists to achieve a more streamlined work process to justify the time and energy you invest in your small business. Because this work isn’t easy. It takes a lot of tender loving care, long hours on your feet, anticipation (or anxiety) regarding product quality, deadlines, contracts, proposals and bill collecting….but when you love floral design like we do, well, you sign up for all this “other stuff”, too. CLICK HERE TO UNLOCK THE VAULT FOR $13 TODAY! I hope you’ll take a leap to check out The Vault! As soon as you buy, you’ll be able to log in anytime right here on my website to access the materials any time. I’ll see you in the course!